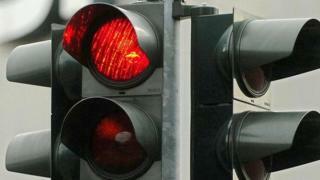 Plans to link up all 1,600 traffic lights across West Yorkshire are being proposed to speed up journey times. The £7.5m traffic scheme would see lights synchronised to ease congestion and reduce travel times by up to 13%, according to a council report. The suggestion could improve the network to better manage unplanned events and reduce air pollution. The plans, which have been recommended for approval, could be put in place by the end of next year. If they are approved it would mean a centre of excellence will be created to train staff to control the lights. The report, which is to be discussed by councillors in Bradford on Tuesday, states there is a problem with staff with the necessary skills to implement the plans. Joel Dodsworth, manager of Leeds traffic control centre, said: "We have a congested network like any major city and we have incidents on an almost daily basis which we have to respond to. "This will allow us to automate things in a better way. "It will help us to bring all the talent for skills and experience into one centre for excellence, which is a positive thing." The plans will be discussed by councillors in all five West Yorkshire districts (Bradford Leeds, Kirklees, Calderdale and Wakefield) and if passed will be implemented by the West Yorkshire Combined Authority.